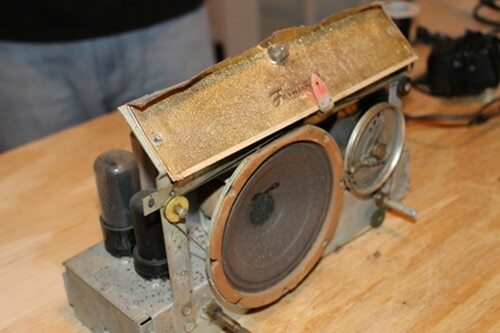 This is theshy way to make an old radio to an speaker for you apple product. 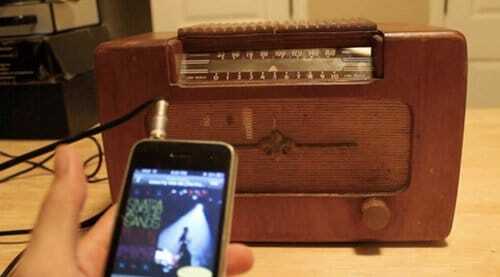 I have done this to my old Radionette radio. The idea i found here. 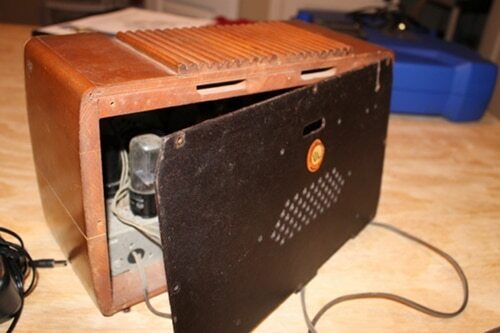 My grandpa's old Philco modded so I can use my iPhone with it. 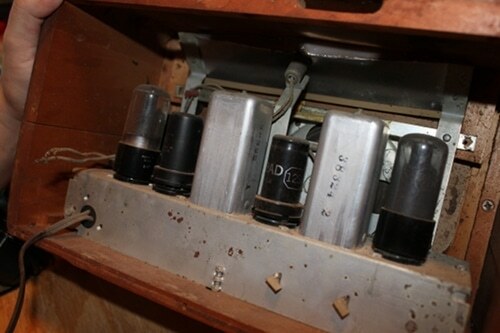 The second approach is to bypass the existing tube amp altogether by adding a new, smaller, and more modern amplifier to the radio and connecting it to the radio’s existing speaker. 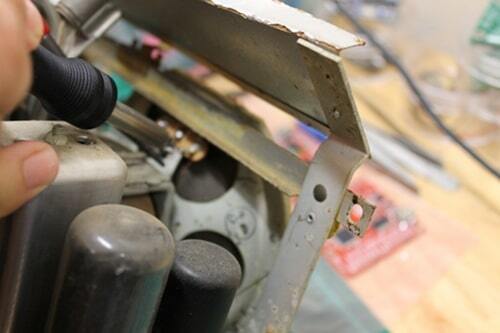 This way is much easier because you don’t need to know how to read complicated electrical schematics. 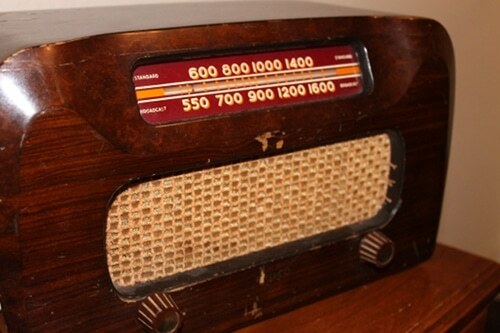 You also don’t need a working radio. As long as your radio has a working speaker, you’re golden. 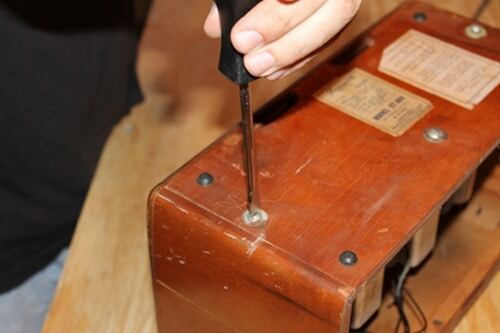 You can even use a radio with a broken speaker. 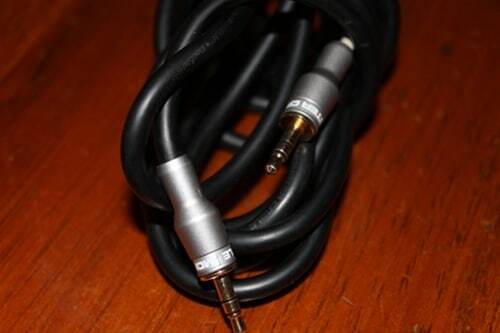 Just buy a new 2″ speaker for $4 and replace the old speaker in a snap. 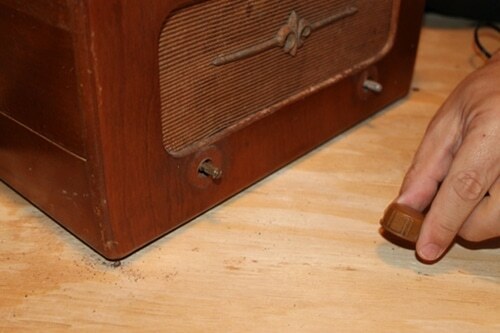 If you decide to use an older radio that lacks a permanent magnet speaker, you can still do this project. 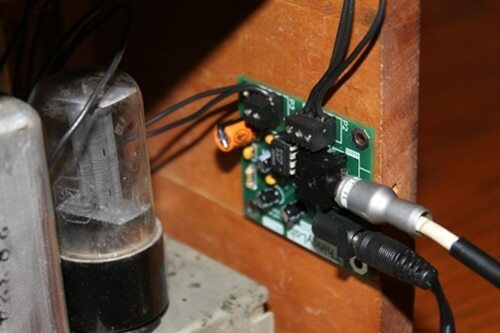 You’ll just need to pull out that speaker and replace it with a permanent magnet speaker. It’s not difficult. 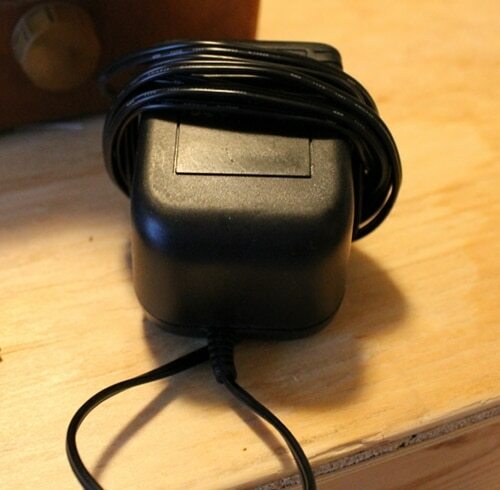 Ryan sells a 2″ speaker on his site for $4. Pick one up when you buy the amp. 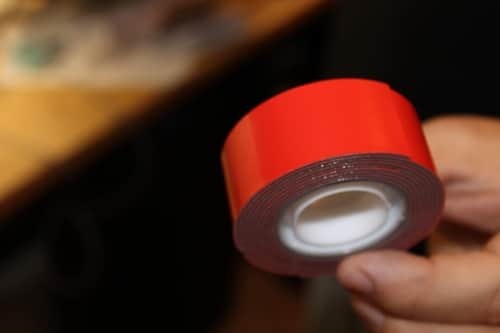 Ryan sells these on his site. 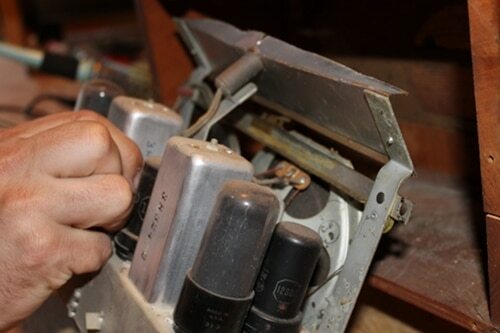 Ryan used his electrical engineering skills and designed these amps specifically for vintage radio mods. 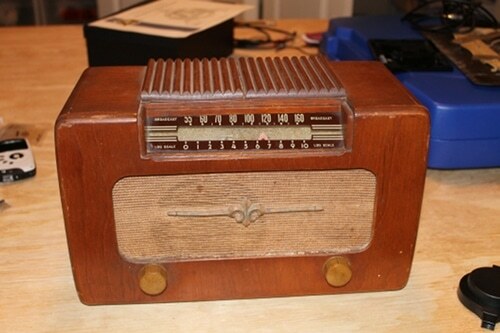 They should work with most types of old radios. You can buy the amps pre-built for $26. Select “Pre-built kit” when you check out. 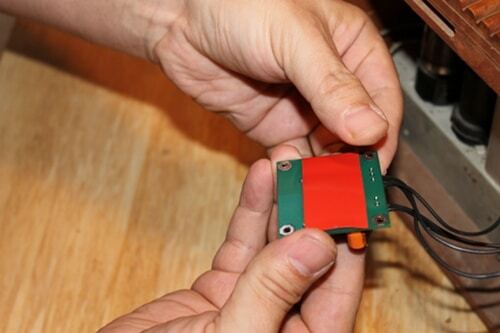 If you’re feeling particularly handy, you can buy the kit and put the amp together yourself. The unassembled kit is $20. 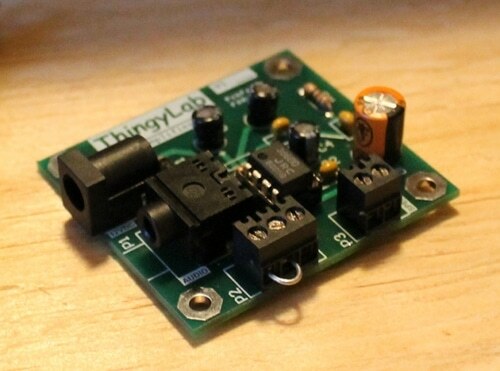 And of course if you’re super handy with electronics, you can experiment with designing your own amp. There's the radio. We're going to be taking that out so we can do some modding. 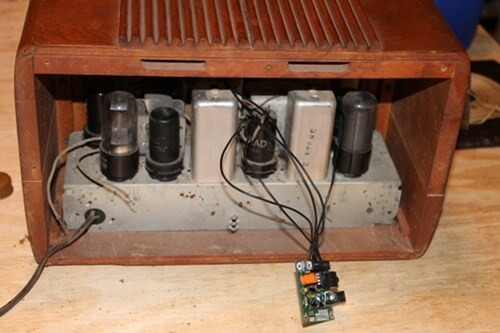 Tuner, speaker, tube amp. Let's get to work modding this bad boy. 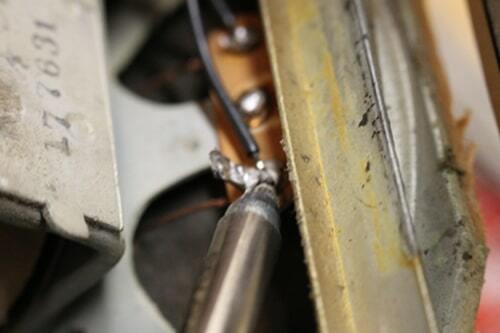 Disconnect the old speaker wires from the speaker's solder terminals. Here they are on our radio. 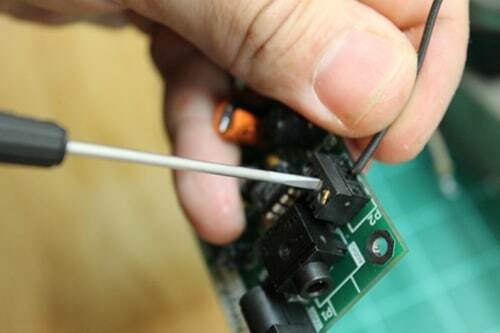 Use your soldering iron to disconnect the old wire from the speaker's soldering terminals. Strip back a bit of the insulation and put some solder on the new wire so it's ready to be connected to the speaker. 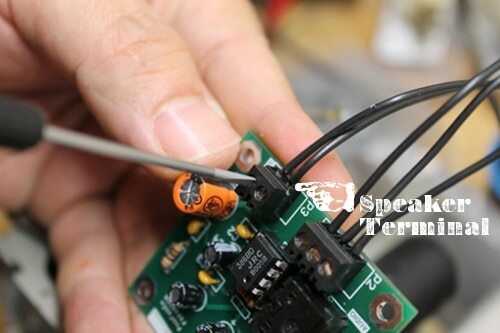 Connect the new wire to the speaker soldering terminal. 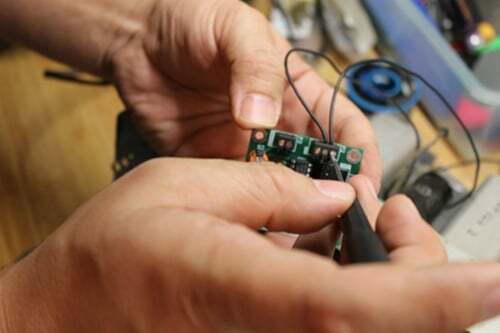 Here's Ryan connecting the first new line of wire to the speaker. 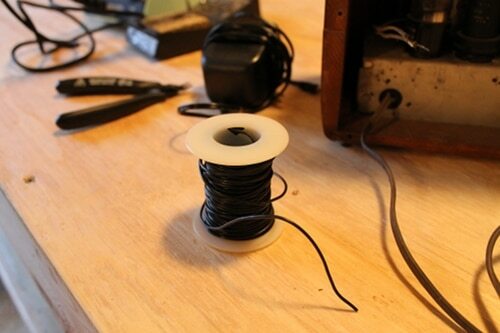 After you solder the wire to the speaker input, cut it so it's long enough to reach the side of the radio cabinet. 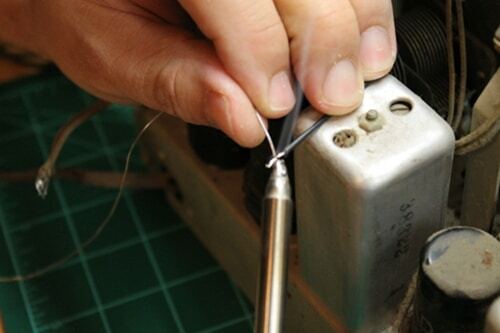 Soldering second wire to second speaker solder terminal. After you've connected the new wire, cut it so it's long enough to reach the side of the inside of the cabinet. We're not connecting any wire to that middle solder terminal. It doesn't do anything. We're done adding new speaker wires. Find the volume knob on the radio. Look behind it. See that black round thing? 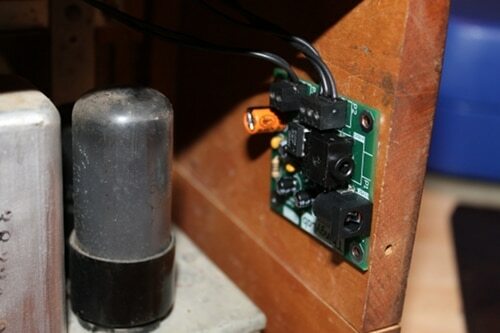 That right there is called a potentiometer, or pot for short. It controls the volume. See that orange thing sticking out from the pot? 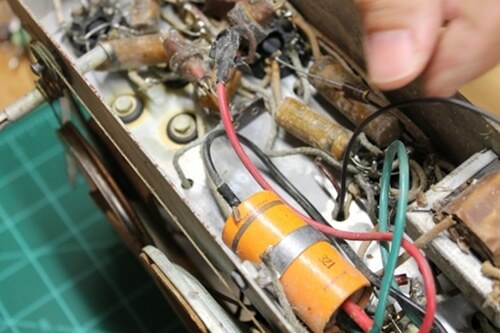 That's a capacitor. 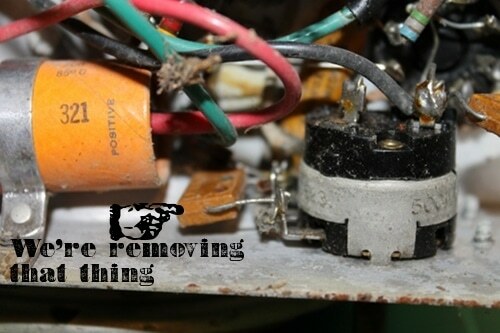 We need to remove that so we can connect some new wire for our new amp. 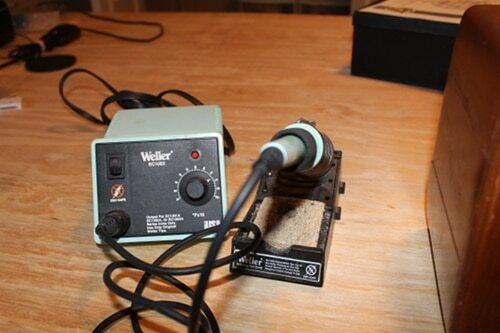 Use your soldering iron to remove the capacitor from the pot. 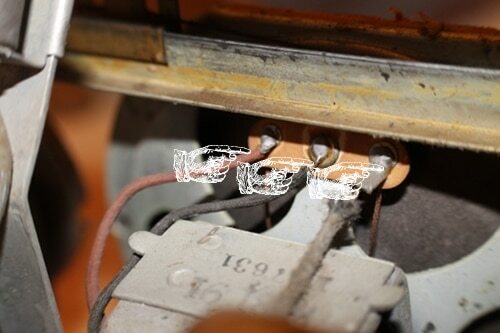 Here's what the pot looks like sans capacitor. 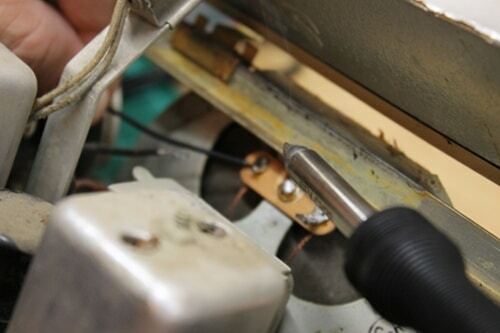 See those three soldering terminals on the pot? That's where we're going to connect the new wire. 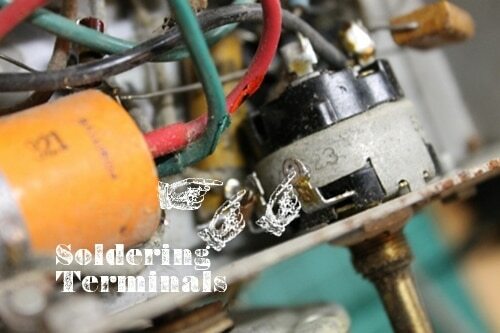 Finished adding new wires to pot soldering terminals. A beautiful sight. 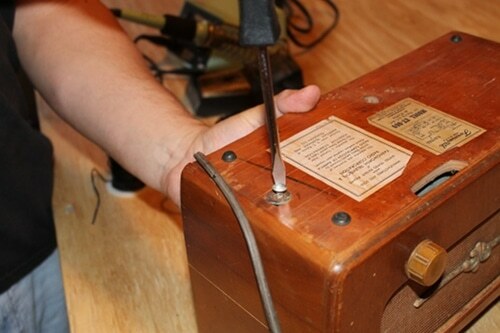 Remember to cut each wire so it's long enough to reach the inside side of the radio cabinet. 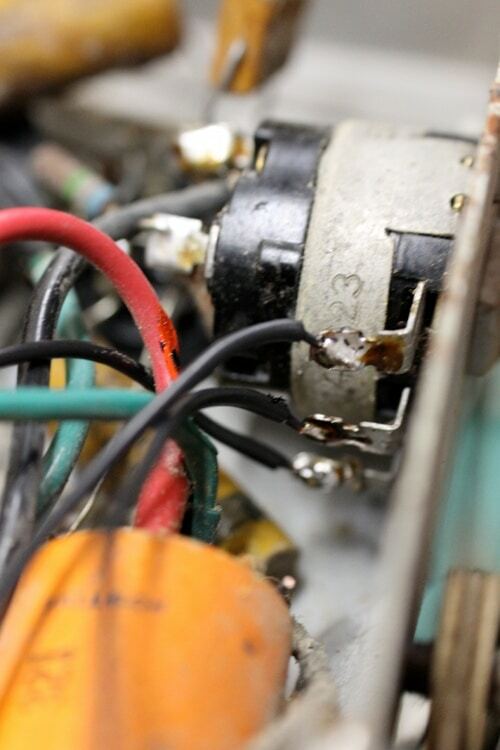 Find the pot screw terminal on the amp. It's the little black thing with three holes in it and three screws on top. 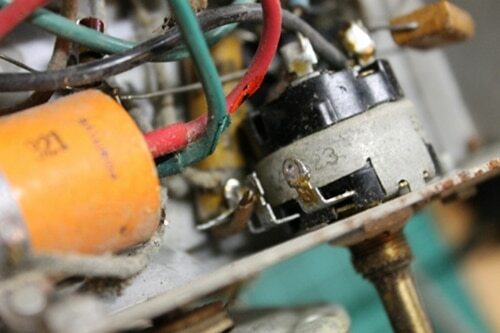 Connect the middle wire from the pot to the middle screw terminal on the amp, like so. 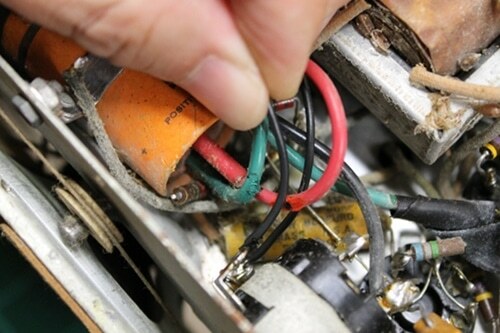 Connect the speaker wires into the speaker amp terminal. It doesn't matter which wire goes into which terminal. All the wires are connected! We're almost done!